BANGALORE, AUG 12: Amazon India has added consumer electronics category to its online store and has announced partnerships with brick-and-mortar companies. The Seattle-headquartered company has entered into tie-ups with a combination of brick-and-mortar retailers like Croma and Vijay Sales, and Internet portals like Compuindia.com and Gadgetsguru, indicating that commerce in India is still considerably influenced by physical stores. Amazon, which made its Indian foray in June, will sell computers and related accessories such as keyboard, portable hard disk amongst 7,000 gadgets, according to a company statement. Prior to this announcement, Amazon India offered e-book readers like Kindle, mobile accessories, cameras, portable media players amongst other devices on its store. However, by introducing computer and accessories section, Amazon India pits itself against e-commerce marketplaces like Flipkart and Snapdeal. The Indian e-commerce market has been growing at a fair clip and currently estimates point out that there are 125 million Internet users in the country, and a majority of them are shopping online. For the past two years, the bulk of transactions are moving online as physical stores are unable to compete on price and customer service with online retailers, according to industry watchers. “This tie-up indicates that this is a win-win situation for consumers, physical stores and Amazon,” said Dinesh Agarwal, founder of IndiaMART, an online shop for businesses. Some industry watchers said Amazon wanted to cash in on the brand awareness of Croma and Vijay Sales in urban and semi urban places. When queried over the reason for having tie-ups with physical stores, an Amazon company spokesperson did not respond. Some e-commerce companies point out that consumer electronics sales in physical stores are declining and this tie-up would help physical retailers to some extent. 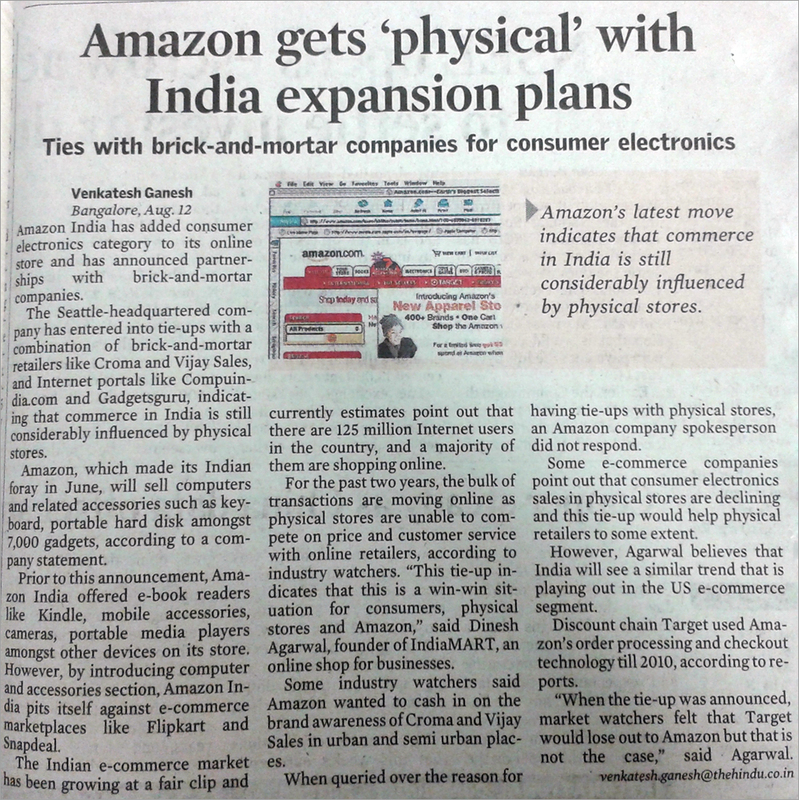 However, Agarwal believes that India will see a similar trend that is playing out in the US e-commerce segment. Discount chain Target used Amazon’s order processing and checkout technology till 2010, according to reports. “When the tie-up was announced, market watchers felt that Target would lose out to Amazon but that is not the case,” said Agarwal.